As the campaign trail hots up, so does the state-wise blogging marathon. We’ve already cooked our way through a dozen states and are now at Karnataka, our very friendly neighbour. The best Bisi bele bath and Vangi bath that I’ve tasted were in Bangalore. You have to give it to the Kannadigas. They really have a way with these rice dishes. I love their curry podis and I like their sambar as well, all laced with a subtle sweetness. I’ve lived in Bangalore for roughly 3 years and I managed to NOT pick up a single full sentence in Kannada. I have a great appreciation for their food though. Although I call it a one-pot medley, it is made in several pots and pans and involves multiple steps but is worth every minute. 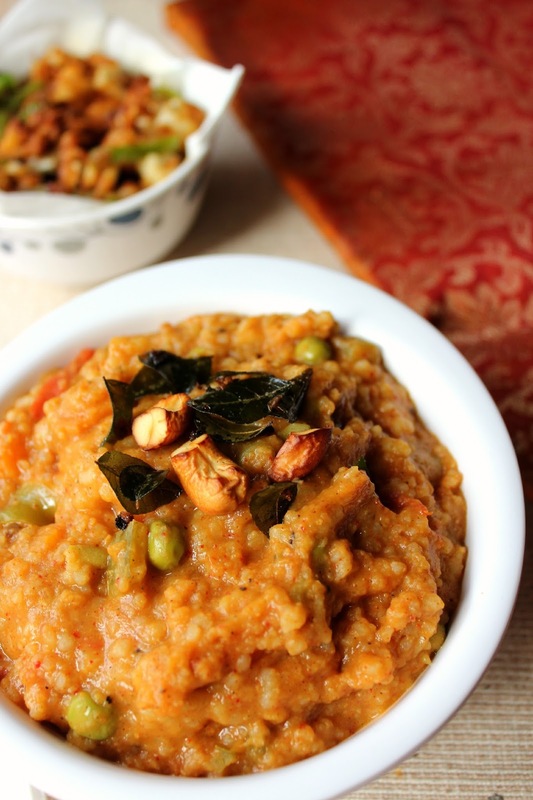 I enjoy the Bisi bele bath served in weddings here in Chennai with sambar onions and potatoes and everything else that is traditionally never a part of Bisi bele bath. 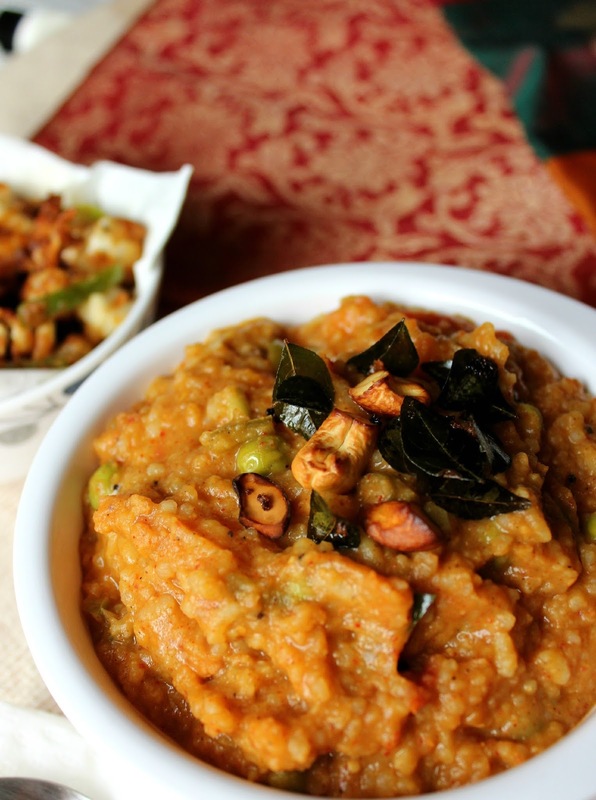 Jagan likes Bisi Bele Bath too – one of the few vegetarian rice dishes that he approves of. Although I’ve made Bisi bele bath several times before, I wanted to try the authentic Karnataka version this time. I relied heavily on the Bisi bele bath recipe at veggiebelly and it is more of a thesis on Bisi Bele Bath than a post – Stunning photographs, minute detailed instructions and a beautiful recipe. I like it that she says “Don’t open the ground up spice powder until you’re ready to add it to the bath or you’ll lose the aroma”. I love that kind of meticulousness. The Bisi bele bath turned out fabulous. I’ll definitely be making it again. I would just be cautious while adding the spice mix towards the end, adding it in in small increments and tasting it as it is very easy to go overboard and I really do like my Bisi bele bath with a little less masala. The best accompaniment to Bisi Bele bath is potato chips. Make this for a weekend lunch and serve hot drizzled with ghee alongside potato chips. Don’t bother making anything else. It’s a complete meal unto itself. And rememer that bisi bele bath has everything in it – rice, lentils and vegetables. It will be very filling. Less is more. Always use smaller quantity of rice for your bisi bele bath than you usually would if you’re just making steamed rice. 1. Cook rice till soft and mushy in a pressure cooker. Set aside. 2. Cook dal till soft and mushy in a pressure cooker. Mash well and set aside. 3. Cook the vegetables except tomatoes and capsicum in a pan with sufficient amount of water, turmeric powder and salt until tender but not mushy. Set aside. 4. Squeeze the tamarind in about 1 cup water and extract juices. Set aside. 5. Dry roast the spices under spice powder in a pan till fragrant but not burnt. Cool. Grind to a fine powder. Keep the jar closed until the time the spice powder is to be added. 6. In a large pot or kadai, heat about 2 tbsp oil. When hot add the chopped capsicum and sauté for about 2-3 minutes. Then add the chopped tomato and sauté for another minute. Then add the tamarind extract and the cooked vegetables. Pour in the cooked dal and the rice and mix well. Add the ground spice powder and mix well. Taste and adjust salt. Mix well. Keep stirring all the while as the dal and rice tend to catch at the bottom of the pan. Add water if necessary to make it a little thinner. Switch off. 7. In another small pan, heat ghee and add the items called for under tempering – mustard seeds, curry leaves, asafoetida and cashew nuts. Once the cashew nuts turn golden, pour the tempering over the bisi bele bath. Mix well. Serve hot with potato chips. 1. Use any combination of vegetables that you prefer. Avoid the slimy, sticky ones like okra or arbi. 2. You could cook the dal and rice together to save time. 3. You can substitute peanuts for the cashewnuts in the tempering or avoid nuts altogether. 4. Add the spice powder in small increments – 1 teaspoon at a time, mix well, taste and add accordingly. This entry was posted in One-pot dishes, Rice & Biryani and tagged bisi bele bath, bisibela bath, bisibele, bisibele bath, Blogging Marathon, karnataka cuisine, karnataka food, one-pot meal, recipe, rice, rice dish. Omg, i cant resist to this wonderful BBB, love the constitency and makes me hungry. Perfecto .. BBB is my handy lunch which is so easy to make . Your pics are so tempting .. I first heard of this dish when I was working in Bangalore. Yours has turned out colorful and appetizing. BBB has turned out with the right texture and consistency that I love Jayanthi..very nicely presented.. Very well presented. Love the spices in this version. Love this hearty & filling dish, especially with potato chips. yumm!! Perfect!! No it should be PPPPPPPPerfect! Love this! Even I made BBB and totally loved it! Your version looks very good too. My cousin is living Bangalore for the past 22 years and I doubt if she can even frame a single sentence in Kannadiga.. 🙂 At least until few years ago she could not speak a word in Kannadiga. Last year I met her, I forgot to ask her if she has finally learned the language. omg BBB is killing me , am carving for it now 🙂 looks fantastic and perfect consistency 🙂 you version is very tempting dear ! !